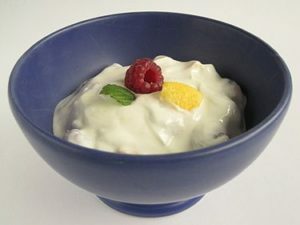 Another study finding health benefits from eating yogurt - that men and women with hypertension who eat at least 2 servings or more per week of yogurt were at a lower risk of having a heart attack (myocardial infarction) and stroke. Women also had a lower risk of a revascularization procedure (such as a coronary artery bypass). The strongest association between yogurt consumption and lower risk of cardiovascular disease was among those with higher DASH (Dietary Approaches to Stop Hypertension) diet scores.The DASH diet is considered a healthy diet, one rich in fruits, vegetables, nuts, whole grains, beans (legumes), etc. The major thing to keep in mind is that high blood pressure is a major cardiovascular disease risk factor. So anything that helps lower risk of heart attack or stroke is good. Note that in this large study they did not randomly assign people to different groups - so the higher yogurt intake people also tended to have a healthier lifestyle. But other studies have had similar findings to this one. For example, eating dairy products regularly is linked to lower rates of cardiovascular disease and high blood pressure, while eating yogurt regularly is linked to lower rates of hypertension and type 2 diabetes. A new study in the American Journal of Hypertension, published by Oxford University Press, suggests that higher yogurt intake is associated with lower cardiovascular disease risk among hypertensive men and women. .... High blood pressure affects about one billion people worldwide but may also be a major cause of cardiovascular health problems. Higher dairy consumption has been associated with beneficial effects on cardiovascular disease-related comorbidities such as hypertension, type 2 diabetes, and insulin resistance. For the current analyses, participants included over 55,000 women (ages 30-55) with high blood pressure from the Nurses' Health Study and 18,000 men (ages 40-75) who participated in the Health Professionals Follow-Up Study. Higher intakes of yogurt were associated with a 30 percent reduction in risk of myocardial infarction among the Nurses' Health Study women and a 19 percent reduction in the Health Professionals Follow-Up Study men. There were 3,300 and 2,148 total cardiovascular disease cases (myocardial infarction, stroke, and revascularization) in the Nurses' Health Study and the Health Professionals Follow-Up Study, respectively. Higher yogurt intake in women was associated with a 16 percent lower risk of undergoing revascularization. Blood Pressure Benefit of Daily Yogurt? Eating probiotics regularly may modestly improve your blood pressure, according to new research in the American Heart Association journal Hypertension. Probiotics are live microorganisms (naturally occurring bacteria in the gut) thought to have beneficial effects; common sources are yogurt or dietary supplements. "The small collection of studies we looked at suggest regular consumption of probiotics can be part of a healthy lifestyle to help reduce high blood pressure, as well as maintain healthy blood pressure levels," said Jing Sun, Ph.D., lead author and senior lecturer at the Griffith Health Institute and School of Medicine, Griffith University, Gold Coast, Queensland, Australia. "This includes probiotics in yogurt, fermented and sour milk and cheese, and probiotic supplements." Probiotic consumption lowered systolic blood pressure (the top number) by an average 3.56 millimeters of mercury (mm Hg) and diastolic blood pressure (the lower number) by an average 2.38 mm Hg, compared to adults who didn't consume probiotics. We believe probiotics might help lower blood pressure by having other positive effects on health, including improving total cholesterol and low-density lipoprotein, or LDL, cholesterol; reducing blood glucose and insulin resistance; and by helping to regulate the hormone system that regulates blood pressure and fluid balance," Sun said.